This paper explores the notion that Elvis Presley is becoming semi-divine by comparing his life story with those of legendary and mythical heroes, and other archetypal beings. Presley appears to fit more than one archetypal pattern of the mythical hero/king/god. His features even resemble some of the ancient ones, as depicted by statues. We live in exciting times. We may well be witnessing a beloved idol on the way to becoming sem-divine. Elvis Presley is already a saint-like figure to many, as witnessed by the prevalence of "Elvis shrines" and the pilgrimage to Graceland. The myth is growing. Myths and legends are based on archetypes. These are frequently used by authors writing modern fantasy fiction of epic proportions. But "mythic structure" is more than the underlying archetype of a good story: myth teaches people how to discern good and bad, right from wrong, and how to order their lives - that is, it is a moral story. This is why the accepted myth of Elvis as a pop star who rose too high too fast and had a mighty fall is so prevalent and acceptable. His is a cautionary tale about the pitfalls of fame and fortune. There are various archetypes based on the "myth of the hero": they include Central Asian and Roman and Greek kings and heroes; British heroes such as King Arthur; the fairytale prince; and, more recently, superhero models. While some may think it is far-fetched to compare a pop singer to heroic archetypes, it is undeniable that a myth is developing around Elvis Presley. There may be some powerful psychological reasons why some people are elevating him to god-like status. The world needs larger-than-life heroes, and Presley appears to meet that need. 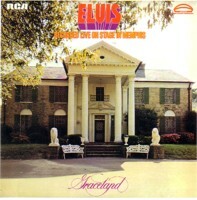 We shall compare the Elvis Presley story to several archetypes, to see how he fits the pattern. 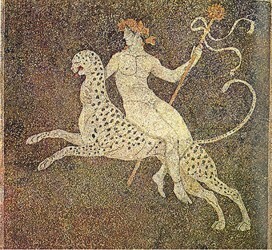 Archetypes are universally understood pattern of behaviour which recur in myths and legends, linking them across time. Definitions of other terms used in this paper can be found in Appendix 1. There are archetypes for human thought and deeds, as well as for faces and figures. In this paper we will look at the theories of psychologist Carl Jung and anthropologist Joseph Campbell regarding archetypes and myths. While Jung's theories are not universally accepted, we will nevertheless explore his ideas in the hope that they may provide fresh insight into the Elvis Presley phenomenon. Jung identified many different archetypal patternings of human thought. These represent ways of thinking and behaving that humans adopt, many times without being fully conscious of the pattern they emulate. Campbell began a revolution in anthropology with his book The Hero With a Thousand Faces. This book built on the pioneering work of German anthropologist Adolph Bastian (1826-1905), who first proposed the idea that myths from all over the world seem to be built from the same "elementary ideas". Campbell took this idea of archetypes and used it to map out the common underlying structure behind religion and myth. The Hero With a Thousand Faces provides examples from cultures throughout history and all over the world. Campbell's thesis is that all stories are fundamentally the same story, which he named the "hero's journey," or the "monomyth." Authors use the "hero's journey" model for writing fantasy fiction in the form of secondary epics. Examples of such fantasy fiction include: Wagner's "Ring Cycle"; Tolkien's "Lord of the Rings"; "Star Wars"; and, "The Matrix" . The hero: As already suggested, there are myths with common themes across cultures and civilisations. These universal myths cover such topics as life, death, the creation of the world, the end of the world, and exploits of men and women (mainly men). Among them is the "myth of the hero". The general myth concerns a young man, usually a king's son, who is abandoned but saved from death. He suffers various trials and ordeals. By overcoming them he transcends the human condition, after which he belongs to a class of semi-divine beings. Examples of such heroes are Siegfried, King Arthur and Robin Hood. The physical journey through life is a metaphor for inner development. Trials and quests are obstacles to be overcome, and are the means by which the hero achieves self-integration, balance, wisdom and spiritual health. Hero myths tend to stem from times of trouble, especially invasion. The Arthurian myth became prevalent in the Middle Ages, based on events in the 5th or 6th century when post-Roman Britons were attempting to stave off conquest from continental invaders. Arthur was a Roman-Briton fighting the Angles, Saxons and Jutes. The Robin Hood myth places Robin in the early 13th century at the time of King John, although he was, in fact, late 14th century. Hereward the Wake was another hero who fought for the Saxons against their new masters, the Normans, after their invasion of Britain. These "popular hero versus the oppressors" myths brings hope in troubled times . While some heroes emerge to combat a specific threat, such as Arthur, Robin Hood or Beowulf, others were more generalized images of the better qualities of humanity: Heracles (Roman 'Hercules') and his legendary labours were both the actions of a hero in combating monsters and acts of redemption: Heracles accepted the labours to redeem himself after killing his family in a fit of divine-inspired madness. If he could become a hero after so heinous an act, then ordinary man could also be saved. The Flawed Hero: We find that many heroes were flawed, and their heroism, despite their faults, was often a theme of their myths. For example, the Babylonian Gilgamesh myths have King Gilgamesh beginning as a tyrant. The Gods send Enkidu, a wild man, to destroy Gilgamesh but the two become friends and share adventures until Enkidu's death. Madeleine Wilson compares Elvis to the Biblical Samson, a Nazirite and judge renouned for his physical strength . He destroyed God's enemies, but because of moral weakness, he lost his strength, was captured, blinded, and reduced to being mocked in front of his enemies. Through his death, however, he destroyed more of God's enemies than when he was alive. The King: There are a couple of king archetypes which we can use for comparison with Elvis Presley. Some of them echo the "flawed hero" theme. The Mystical King with Healing Powers King Arthur is the obvious example of a legendary king with mystical healing powers. The Arthurian/Celtic cycle provides a classic example of the shadow archetype (explained in Appendix 2) as a reflection of the hero and dark side of humanity. Mordred is a reflection of his uncle (in some variants of the myth, father) Arthur and represents directly Arthur's dark side. When Arthur kills Mordred, and is in turn fatally wounded, he is not only good defeating evil, but also a good man defeating his own dark thoughts and dark actions . The Wounded King: The "Elvis ~ A Lighted Candle" web site proposes that Elvis's greater overall archetypal role is that of the "Wounded" or "Lame" King, also based on King Arthur. The wounded king is generally considered to be the guardian of the "Holy Grail consciousness", but is not adequately empowered to carry out the job. The Wounded King must be healed, but this not possible until the rightful recipient of the "Grail consciousness" comes along and claims the Grail. This is Perceval, who asks the right questions about the king's wound, the bleeding lance and the grail, at which the king is cured. Perceval succeeds the old king, takes on his powers, and becomes King of the Grail. Taoist king: Another way of looking at the king archetype, again with particular reference to Presley, is from a Taoist viewpoint. Rosen, in The Tao of Elvis, illustrates Elvis's Taoist nature and interprets his never-ending search for purpose and meaning. The book highlights Elvis's journey from light into dark, focussing mainly on the double-edged quality of the king archetype - how it can function either as a channel to the divine or a destructive mechanism for the one who tries to live it out in human form. While Elvis may not have achieved transformation or "wholeness" (in the Jungian sense) in his lifetime, there is a possibility of redemption for Elvis and for us. "We can, in a sense, make him whole by finding meaning in his suffering (something he was not able to do himself). ... Our awareness of our own weakness and vulnerability is the fountainhead of empathy. Elvis had this awareness (at least some of the time) along with a great capacity to care for others." Rosen says that Elvis failed to transform his 'false king self' into his 'true creative self'. Here is another, related, quote: "Elvis, like a giant mirror, reflects our own struggles with forces of good and evil, and creation and destruction. In a real way, when we see Elvis we see ourselves. Symbolizing the battle between the true and false selves in us all, Elvis's huge appeal lies in his power as an archetype - his epic rise and fall captures what is in all of us. Through understanding the Tao of Elvis, we can come to better understand ourselves. " The Saviour: The tendency to deify Elvis (along with George Washington) reveals the operation of the saviour archetype, a seemingly innate psychological disposition to attribute divine attributes and powers to great religious leaders or other prominent figures. There are significant parallels in accounts of the alleged saviours in the world's religions, concerning the saviors' attributes, experiences, and plans for human redemption. The conditions listed below have been identified on the "Saviour Archetype" site as the most distinctive conditions for being a saviour. They occur to varying degrees in various religions. The saviour's birth and life are foretold in prophecy; the saviour has a miraculous birth; the saviour has a royal genealogy; the saviour is threatened in infancy; the saviour is tempted by demons; the saviour works miracles; the saviour is a deity with a triune nature; - Chritianity; Buddhism's "three manifestations or bodies"; Zoroastrian's masculine and feminine trinities; the three Greek/Roman gods Zeus, Hades and Pseidon) the saviour offers redemption through grace; there is a baptism of water; - Christianity; Hinduism there is a communion of bread and wine (water); - Christianity; Judaism; Mithraism; sacred meals of bread and wine were also taken in the rites of Dionysos (see photo opposite), Orpheus, Cybele, and Attis the saviour condemns those who do not believe (or who lead sinful lives); the saviour transfigures himself; and, the saviour rises from the dead and ascends into heaven. Relating the saviour archetype to fantasy fiction, it appears that Tolkien's The Return of the King was probably inspired by the legend that King Arthur, like Christ, will one day return to reward good and punish evil. The Return of the Jedi also echoes this title . Rosen remarks on the spiritual side of Elvis: "Elvis was on a spiritual quest, which is surely related to his later being seen as a religious figure. His favorite songs were gospel, and central to his spiritual life were the books The Prophet, The Impersonal Life, Autobiography of a Yogi, and the Holy Bible. He also practised meditation and belonged to a world-wide yoga organization, the Self-Realization Fellowship." There is no denying that religious parallels are emerging concerning Elvis, although his life story does not fit the saviour archetype. He does set out on a spiritual journey in parallel to his career. He does suffer various trials and tribulations, challenges and set-backs on the way. According to the "Saviour Architype" web page, "Elvis devotees have apparently predicted that Elvis will come back from the grave and sing again - maybe Elvis sightings echo the concept of the hero's return". Whether this prediction is factual or a facetious invention of the author's is difficult to determine. But actually, during his lifetime Elvis was credited with at least one possible healing or faith cure, and since his death he has been reported to have appeared to people in time of need and helped them. Furthermore, the numerous sightings since Elvis's death can be divided into two kinds: "Live Elvis" and "Spirit Elvis". "Live Elvis" sightings perpetuate the lore that Elvis is still alive, while "Spirit Elvis" stories involve elements of magic, instruction and healing, and elevate Elvis to a figure of myth and miracle. "They conform to the framework of folklore" - that is, they fit an ancient archetype. The Fairytale Prince: Yet another version of the mythical hero is present in fairy tales which tell of an untried youth in humble circumstances going out into the world to seek his fortune. He may have royal parentage without knowing it. He eventually wins the hand of a princess in marriage and rule over half a kingdom. But first he must undergo a succession of tests and quests. "In Jungian terms, fairytales are "the purest and simplest expression of collective unconscious psychic processes." Elvis is a good example of the rags-to-riches story, the poor boy who makes his fortune, becomes King of Rock and Roll and marries a beautiful "princess". But, in keeping with the modern world, there is no "happy ever after". His story sets a new model for modern family break-up, and the perils of fame and drug-taking. So Elvis fits the old archetype, but at the same time becomes a new archetype. It is a powerful myth which people want to believe because it is also a cautionary tale that fits our era. Superhero: There are more modern hero myths. Comic book characters can also conform to the myth of folklore heroes, as for example, Superman. In real life, Superman is a humble person, but is transformed when the need arises into a superhuman figure who helps to save the world. In the Elvis story, there are also elements of Superman: offstage Elvis is an ordinary person, but once on stage in his costume he becomes larger-than-life, assumes great power and holds sway over vast audiences. 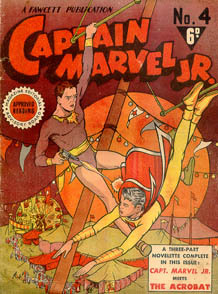 Indeed, Elvis's childhood comic hero was Captain Marvel Jr. You can see the resemblance between Elvis's costume and Captain Marvel Jr.'s. III: Return Refusal of the return The magic flight Rescue from without Crossing the return threshold Master of the two worlds Freedom to live The hero's journey does not match the career path of a twentieth century popular singer very well. II: Initiation - young man shoots to fame. The road of trials - young man is vilified in the media and from pulpits; he is prevented from turning to religion; he is prevented from touring abroad; his singing and movie career is stifled. Temptation away from the true path - young man is sidetracked by the pleasures of the flesh. Atonement with the father - puts religion into his concerts. III: Return - "Live Elvis" and "Spirit Elvis" sightings; "Elvis is everywhere". Faces: In addition to archetypes for human thought and deeds, there are archetypes for faces and bodies. Let's have a look at some faces - and see how Elvis fits in. 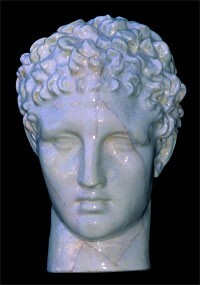 In fact, if we compare Elvis's face with those of ancient heroes, kings and gods, there are some striking similarities. Examples (above): The shapes of the noses and lips are particularly striking. The setting of the eyes and the shape of the face fits to varying degrees. Whether or not heroes and kings actually looked like their representations, they display the ideal of beautiful features of their era. Elvis certainly seems to have conformed to the ideal of Greek beauty. According to the Lighted Candle web site, Elvis's photographs were used as studies to re-build Old World statues damaged during the bombings of WWII. 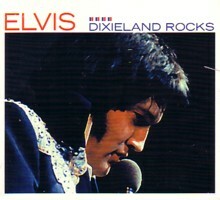 Some of the archetypal elements listed in the Appendix resonate in the story of Elvis's life. The shadow, for instance, brings to mind these words from the song "And I Love You So": "Shadows follow me, And the night won't set me free." Then, there is the protective and nurturing mother, and the maiden who is to be protected from monsters and shadows, but who, because of flaws, may cause the destruction of the hero. Certainly, Priscilla was involved in the burning of Elvis's religious books in 1967, which was a setback to his spiritual journey. The controlling elements around him did not want Elvis to become more religious, and Priscilla was probably used by them. Overall, how does Elvis match up against the myth of the hero? Elvis matches some elements in most of them. On first sight, the fairytale prince is the closest, with a modern twist. Elvis himself becomes an archetype for the modern day family breakdown and the dangers of fame and drugs. But also, he was a type of superman in his own way - an ordinary person who became larger than life onstage and reached out to masses of people - and he even had the classic features of ancient statues! Heroes can have flaws and still find redemption. 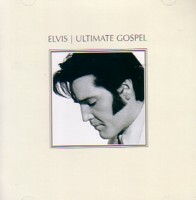 While Elvis does not particularly fit the saviour archetype, the shrines, pilgrimage and candlelight vigils suggest a strong religious aura around him. For his part, he did not see himself as the leader of a new religion or cult, but as a conduit to existing faiths. The Lighted Candle site considers that Elvis best fits the wounded king archetype: Elvis was inadequately empowered and could not complete his mission. Rosen, in The Tao of Elvis, also suggests that Elvis failed to conquer his internal demons and achieve the necessary transformation or "wholeness", but that he can be redeemed through his suffering and his empathy for the suffering of others. "His problem was that he was not fulfilling his destiny. Sometimes it breaks your heart to know how unhappy he was. Elvis should have been a preacher. He knew what he was meant to do, but the pressures on him were so great." But did Elvis really fail to fulfill his destiny? That depends, of course, on what you think his destiny was. Certainly his career was stunted and stifled by his manager, and Elvis himself thought he was going nowhere. He failed to find fulfilment and peace of mind on a personal level. However, if his mission was to preach and bring people back to spiritual values, then maybe he did succeed and is still succeeding. He incorporated preaching into his later concerts, reading the Bible and singing gospel songs on stage. Even now, so long since his death, there have been instances of people being drawn to religion as a result of listening to Elvis's music, especially his gospel songs. "We still create myths and heroes today. We need heroes to look up to and help us make sense of our own lives. In the USA, John F. Kennedy was a typical example of the mythologizing of a human figure: his achievements have become enhanced despite his failings, and his tragic death sealed the legend. Similarly, Ataturk in Turkey or Gaddafi in Libya have been mythologized by their cultures. There are many others. We still need heroes, and are prepared to forgive their faults in return for their defeat of shadow, and their presence as beacons of hope." The Presley story is particularly powerful because it fits the "myth of the hero" archetype in more ways than one - the "rags to riches" fairytale prince, the power/powerlessness of Superman/ordinary person, and even the king archetype. We know that, like Heracles or Samson, Elvis wasn't perfect, but we know that he can be redeemed. Elvis even had classic facial features, reminiscent of ancient heroes, kings and gods. The fact that he does not fit the saviour archetype very well suggests that he may not head a new religion or cult, but that is by no means certain. He was a charismatic figure who changed many people's lives, leaving behind stories and legends and reports of miracles. This is how new religions are born. His story resonates strongly within us because of unconscious "cultural memories". Whether as a secular or religious hero, pagan or Christian, Elvis is becoming elevated to a higher plane. "Bilbo's World : Introduction to Fairy Tales"
Campbell, Joseph, The hero's journey. Harper & Row, San Francisco, c1990. 255 pp. Campbell, Joseph, The hero with a thousand faces. Princeton University Press, 1968, 2nd ed. 416 pp. 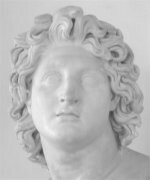 Eliot, Alexander, The universal myth: heroes, gods, tricksters and others. Penguin, New York, c1976. 310 pp. P., Terri, "Not just for Elvis Fans ... " [Review of The Tao of Elvis], Amazon.com, 2002? Patterson, Nigel, "Elvis: Sightings and Faith - Making Sense of the seemingly Absurd", Elvis Symposium 2003-04. Rhodes , Peter, "In another World - Elvis the Preacher", Express & Star, December 23, 2002. Rosen, David, The Tao of Elvis. Harvest Books, 2002, 224p. Steele, Helen, "Myth across Time: Jung, Archetypes and Strange Journeys". Mythos: fantasy & myth, Issue Twelve, October 1998. Strausbaugh, John, E: reflections on the birth of the Elvis faith. Blast, New York, 1995. 223 pp. Wilson, Madeleine, Prayers of Elvis. Shalom, [Wolverhampton], 2002.. 31 pp. Archetype: = primal pattern, prototype, model, blueprint, standard or framework; "ancient imprints" ; universally understood pattern of behaviour. Archetypes link myths and legends across cultures and across time. Demigod: = a mythological being with more power than a mortal but less than a god; a semi-divine being. 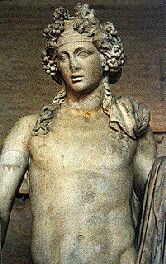 Strictly speaking, the demigods of Greek mythology were"half-gods," one of whose parents was a god and the other was a human. The term "demigod" is sometimes used to refer to minor gods, though this is not the proper definition of the term. Fairytale: = a fictitious narrative with a human main character where the narrative includes fantasy and is told as entertainment but which can also carry serious meanings at many levels. Myth: = stories across all cultures that are used to explain, rationalise and explore. "Myths are the Dreams of the Race: Dreams are the Myths of the Individual" (Freud); = the conscious manifestation of archetypes within racial memories in the unconscious mind (Jung). Primary Epic: = A long, adventurous story that ties together all the oral myths and traditions of a culture into a single heroic story. Examples of primary epics include: Kalevala (Finland); Beowulf and Le Morte D'Arthur (Britain); Gilgamesh (Mesapotamia); The Iliad and The Odyssey (Greece); The Ramayana and The Mahabharata (India); Heike Monogatari (Japan), Chanson de Roland (France). Secondary epic: = A story created in the style of the epic based on the authors' own imagination, rather than on oral history. Examples of secondary epics include: Aeneid, Divine Comedy, Paradise Lost. Death: Death haunts the Hero. It is a recurring theme for heroes to cause the deaths (accidentally or deliberately) of their own fathers or mentors; and many heroes die prematurely or tragically. Mentor: Often, the mentor is personified as a wise old man, but can be any companion who brings advice and aid to the hero. It is the Mentor who explains the inexplicable. He cannot defeat the shadow himself, but provides the hero with the knowledge to do so. Examples in myth include Merlin (King Arthur), Obi-wan Kenobi (Star Wars), Lugalbanda and Eabani from the Gilgamesh myths. The Mentor can also be described as the Father figure: he nurtures and trains the hero, without necessarily being a hero himself. Mother: She represents fertility, warmth, the protection of home and hearth. She need not necessarily be the mother of any of the protagonists, but fills the eternal need. Mother archetypes are particularly common in myths about the gods. Mothers are the protectors and nurturers of heroes. Maiden: The virgin, the pure object of love, for the hero to protect from monsters and the shadows. Like the hero, she may have faults, and in many cases, the maiden causes the destruction of the hero because of her flawed (female) nature. Shadow: The shadow is the dark side of humanity, represented by: demons in theological myths; dragons and monsters in classic hero myths; Mordred in the Arthurian myth; Grendel, Darth Vader in the Star Wars movies. With these shadows, societies are able to explain the darkness within and rationalize them. Of course, the shadow can also equate with external evil. Evil gods were replaced by a single adversary, Satan, in monotheistic religions. Then, sometime during the 19th century a new metaphor for evil appeared which may be replacing the idea of a literal Satan: The Machine (also called The System). This idea may have been introduced by Alfred Lord Tennyson (1809-1892), in his Idylls of the King (which retells the King Arthur myth). Tennyson used the Industrial Revolution, machines in particular, as the symbol of evil. In a sense science had "killed God" by seemingly disproving some of the literal claims in the Bible, and machines were seen as the physical embodiment of science, so spiritually-hungry Victorians embraced this idea. Redemption: A common aspect of shadow myths is the theme of redemption. George Lucas recognized this in "The Return of the Jedi" when Darth Vader confronts the dark side, achieves redemption and is no longer the shadow. He becomes instead the Wise Old Man.